Start by boiling your rice in a large pot of salted water and add the stock pot. When its cooked but still has a good bite to it, drain the rice, reserving two ladles of the cooking water. Leave your rice out to cool in your colander or on a plate. Get your mackerel out of the packet and flake it onto a plate and set aside, you shouldn’t have to grill or cook this in any way. 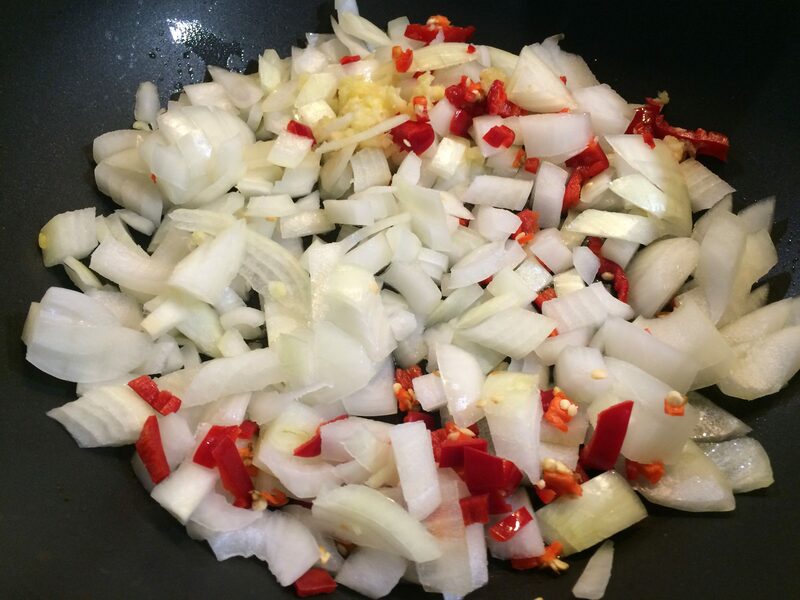 In a wok or large skillet, heat a splash of vegetable or olive oil and add your onions, garlic and chilli and cook until the onions are softened. Add the cumin and coriander seeds so they start to heat up and sizzle, then add your powders and stir well. By now this should all be smelling heavenly and you should be patting yourself on the back and nodding. Garlic, chilli and onion, go! Add your cooked cold rice and stir well to incorporate all the flavours into the rice and then add your frozen peas to start to heat through and a splash of the cooking water. Once everything has heated through add you mackerel flakes and then fold in gently, you don’t want to obliterate the lovely flakes of fish, we need texture Dear Reader! 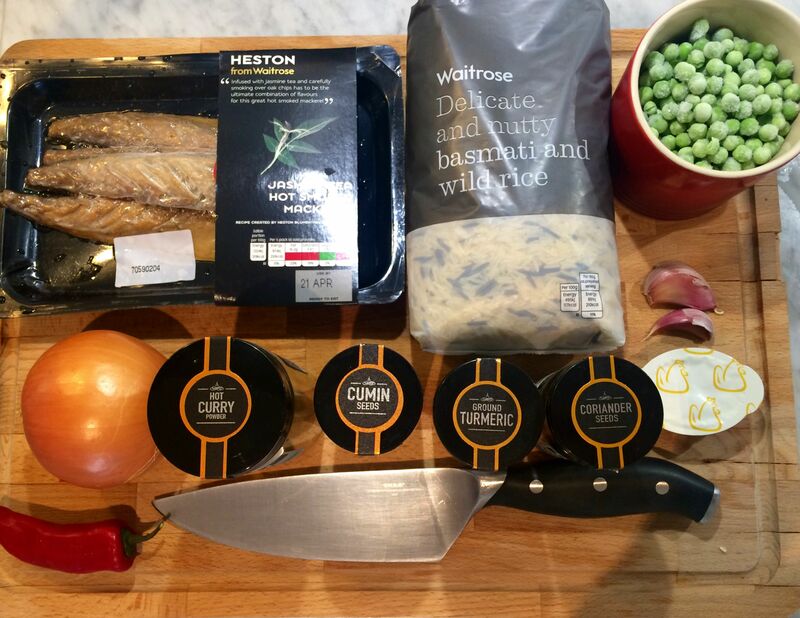 Turn the heat right down on your kedgeree and put the lid on the pan. If you’re worried about it being too dry, by all means add some more of your cooking water but don’t obliterate the texture, it’s not a risotto-like texture we’re aiming for, kedgeree should be much drier and lighter. You’re on the home stretch now, we only need to poach the eggs. My controversial method goes like this; fill a shallow frying pan with about an inch and a half of water, maybe two inches, salt it and set it to a rolling boil. When you reach the rolling boil, crack your egg into a mug and tip it gently into the water, then reduce the boil to a mere bubble. The most important thing is to set the whites, so cooking should only take 3-4 minutes at maximum. Turn the heat off then gently tip the water out of the frying pan and use a slotted spoon to remove the eggs. Plate up your kedgeree with a sprinkle of coriander and place your poached egg on top. End to end this process will have taken you about 20 minutes and YOU, Dear Reader are the Usain Bolt of dinner! Serves two people, choose your guest wisely.